← Record breaking rainfall and cold weather grips South Africa. St Catherine’s Point, on the Isle of Wight, recorded only 1.4 mm of rain, currently the station’s driest July on record. 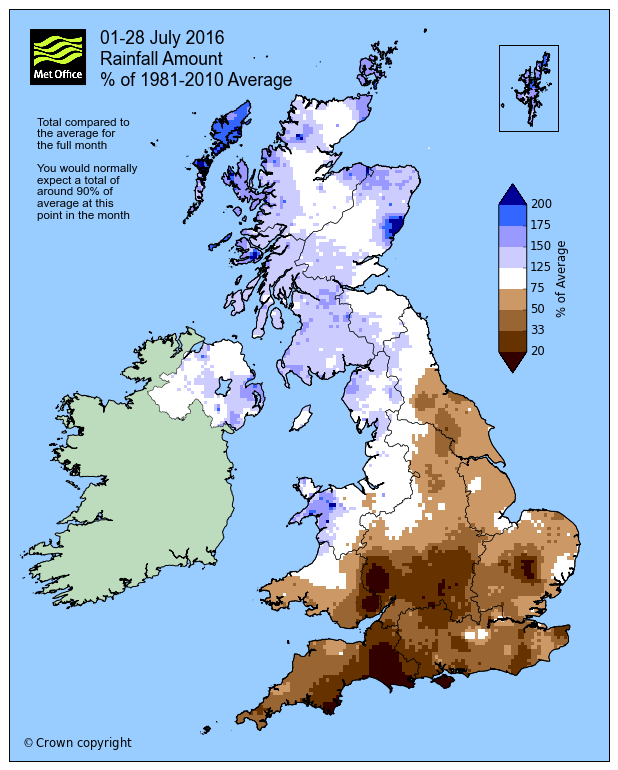 Meanwhile the month saw some very wet weather in the northwest, with Stornoway Airport recording 140.0 mm (87% above average) ranking it currently as its 3rd wettest July on record (wetter years being 1939 with 143.7 mm and 1988 with 164.5 mm). However although it has been dry for many it has been dull with sunshine amounts below normal for many. This followed on from a rather dull June. Despite a cooler start to the month (with nowhere in the UK reaching 25 °C at any time during the first fortnight), things began to warm up from the 16th onwards, leading into the hottest spell of weather this year so far, with sunnier skies, and temperatures reaching 33.5 °C at Brize Norton on the 19th. The “heatwave” was relatively short lived however with a return to a mix of sunshine and showers as we moved towards the end of the month. The rather cloudy days and below average sunshine levels might have left the impression of a poor month weatherwise, but in actual fact temperatures so far have been marginally above average, although the slightly warmer nights have helped keep the mean figures (24 hour temperatures totals) around average. 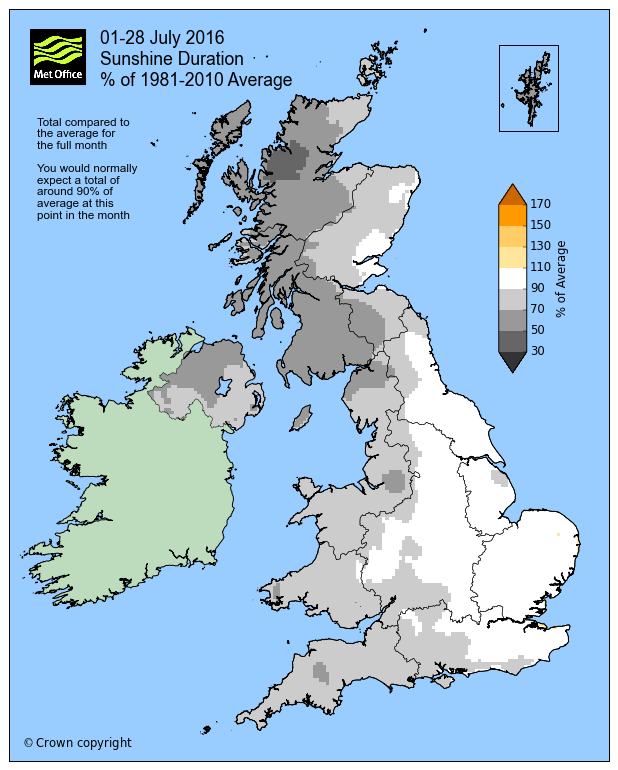 For southern England at least rainfall has been very low with west Scotland and the Western Isles having the worst of the rain. You can keep up to date with the weather using our forecast pages and by following us on Twitter and Facebook. You can also monitor the accuracy of the current day’s forecast for your location using our weather verification page. This entry was posted in Met Office News and tagged cold, dry, England, forecast, Met Office, rain, rainfall, record, summer, sunshine, temperature, UK, weather, weather forecast, weather forecasting. Bookmark the permalink. I know I’m being extremely picky, but shouldn’t that be more of a NW-SE split, with below average rainfall all the way up the eastern side of England as far north as Northumberland?